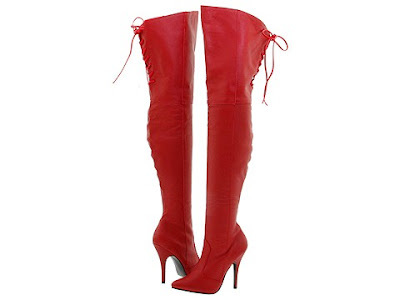 Can you post a picture of the boots along with the outfit, Rihanna wore on Jay Leno last night? Okay, this request burnt me out!!! I looked high and low for RiRi's boots and at this point, I think it's even safe to say that she was wearing leather thigh high tights with a heel. Insane, but very possible with her unique style. Rihanna's style is mostly high end with labels such as Balmain, Balenciaga, Alexander McQueen, Luis Vuitton, Givenchy, Christian Louboutin, and Pierre Hardy as her mainstays. Recently, she also has been spotted flaunting Alexander Wang heavily. See below pic. Rihanna was on her way to an event at during NY Fashion Week.